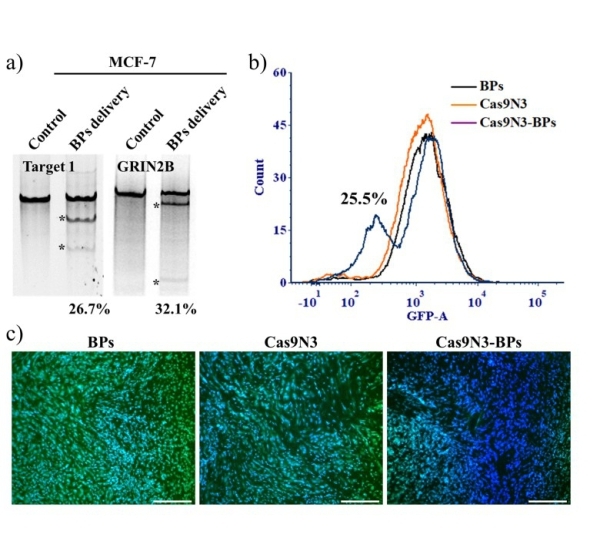 A research team led by Prof. YU Xuefeng at the Shenzhen Institutes of Advanced Technology (SIAT) of the Chinese Academy of Sciences has reported a two-dimensional (2D) black phosphorus nanosheets (BPs)-based platform, which can efficient cytosolic delivery of Cas9-sgRNA ribonucleoprotein complexes, thus provide efficient genome editing and gene silencing in vitro and in vivo. The CRISPR/Cas9 system (known as Clustered Regularly Interspaced Short Palindromic Repeat/CRISPR-associated protein 9), was originally derived from the adaptive prokaryotic immune system, has been widely applied as a prominent tool in many fields, including transcription regulation, genome editing, in situ DNA/RNA detection, etc. However, therapeutic potentials of traditional approaches delivering DNA components encoding Cas9 protein and sgRNA are limited by possible insertional mutagenesis and over-dosing, which will cause increased risks of genetic disorders and off-target effects, respectively. 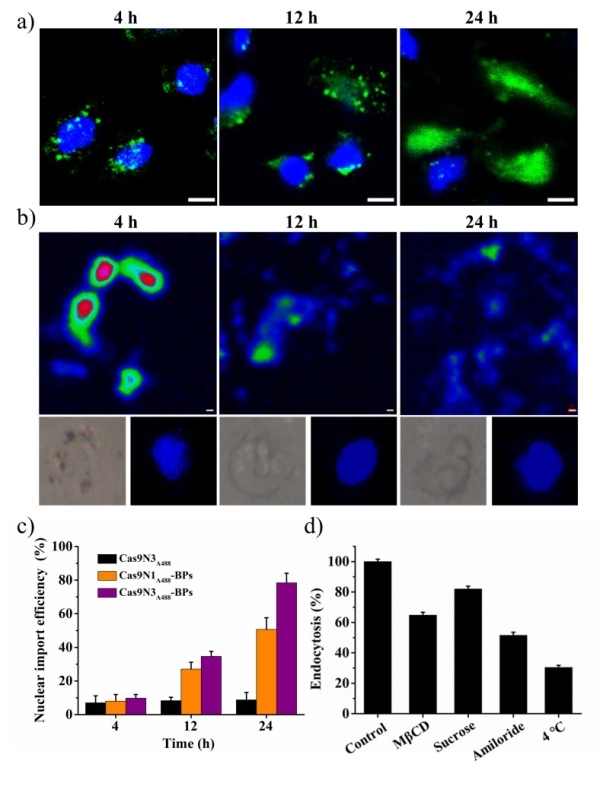 To overcome these problems, direct delivery of Cas9-sgRNA ribonucleoprotein complexes followed by sustained releases has been regarded as an attractive strategy both in basic research and therapeutic applications. BPs-based approaches have been widely reported in numerous biomedical applications due to their superior biodegradability and biocompatibility, distinctive physical and chemical properties as well. Based on previous reseaches studied by Prof. YU Xuefeng’s group, the research team proposed that BPs have great potentials in cytosolic delivery of bioactive macromolecules, such as Cas9-sgRNA ribonucleoprotein complexes. 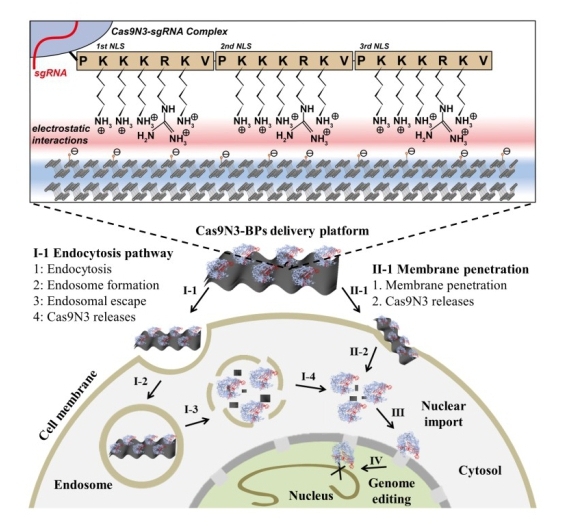 In this study, the research team reported a biodegradable two-dimensional (2D) delivery platform based on loading black phosphorus nanosheets (BPs) with Cas9 protein engineered with three nuclear localization signals (NLSs) at C terminus (Cas9N3). As shown in Figure 1, Cas9 protein was first engineered with three repeats of nuclear localization signals (NLSs) at C terminus for the enhanced electrostatic interaction and improved nuclear targeting of the obtained Cas9-sgRNA complexes (Cas9N3). The constructed Cas9N3-BPs were delivered to cytoplasm via both direct membrane penetration and endocytosis pathway followed by endosomal escape upon biodegradation of the ultra-thin BPs, and the released cytoplasmic Cas9N3 were further imported to nuclei directed by NLSs, which is shown in Figure 2. Subsequent in vitro and in vivo studies both demonstrated that Cas9N3-BPs platforms resulted in efficient genome editing and gene silencing at a relatively low dose as compared with other nanoparticles-based delivery platforms, as shown in Figure 3. This simple and versatile cytosolic delivery approach may extend to other bioactive macromolecules for biomedical applications, and its superior biocompatibility and biodegradability may open new avenues in gene therapy and personalized medicine. This work named “Enhanced Cytosolic Delivery and Releases of CRISPR/Cas9 by Black Phosphorus Nanosheets for Genome Editing”, has been published in Angewandte Chemie International Edition. 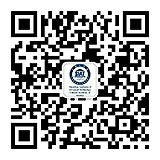 This research work was supported by the National Natural Science Foundation of China, International Cooperation Project for Science and Research Plan of Shenzhen, Frontier Science Key Programs of Chinese Academy of Sciences, and the Leverhulme Trust.